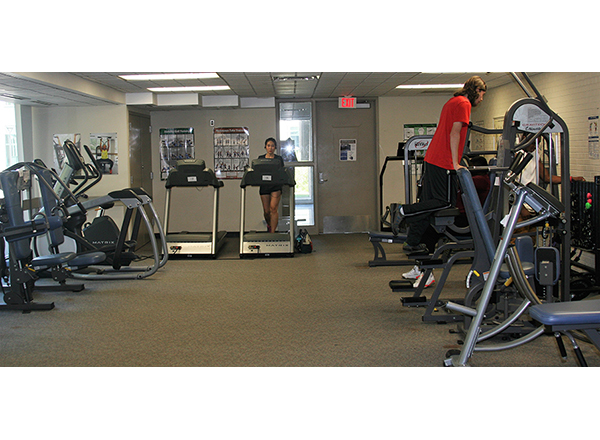 If you’re looking to stay in shape as we head into the fall, the Fitness Center (Room H-108) in the Athletic Memorial Building (Bldg. H) has you covered. One of the campus’ best-kept secrets, the Fitness Center welcomes all faculty and staff access to use state-of-the-art ellipticals, treadmills, rowing machines, various nautilus machines, and free weights – at no charge with your employee ID. • Monday: 8:00 to 10:00 a.m. and 1:00 to 5:00 p.m.
• Tuesday: 8:00 to 10:00 a.m. and 3:00 to 5:00 p.m.
• Wednesday: 8:00 to 10:00 a.m. and 1:00 to 5:00 p.m.
• Thursday: 8:00 to 10:00 a.m. and 3:00 to 5:00 p.m.
All users must sign in daily. No food and beverages are allowed in the Fitness Center. We recommend that employees leave their personal items offsite, or locked in the locker room. Proper athletic attire, including footwear, must be worn. Before visiting the Fitness Center, employees should bring their HFC ID cards to Campus Safety (Building N) so your card can be set up to access the room. For questions and/or more information, contact Kouakou at jgkouakou@hfcc.edu. Please consider consulting with your physician or health care provider before beginning any new fitness regimen.